An uncomplicated, user-friendly little rondo, whose fairly liberal dose of silliness has, over more than twenty-five years, delighted children who have played it (and probably irritated a lot of grown-ups). A decent pianist, capable of accuracy without earnestness, is required. Further performance suggestions are at the back of the score. 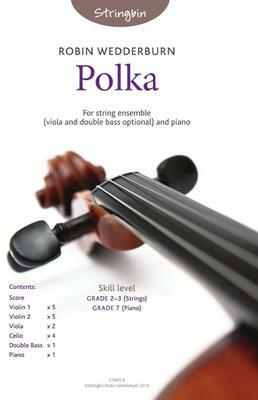 Polka will work well for solo strings - two violins, cello and piano (without viola) or for string orchestra (with or without violas) - with piano in both cases, and without double bass if it really has to be so. What do you want to know about Polka?